The Android ecosystem expanded in a new direction today at the annual Cisco Live! event in Las Vegas, as Cisco announced a "First-of-its- kind HD Video-Capable Business Tablet" based on the Android operating system. While Apple has been promoting the iPad for use in the enterprise, the new Cisco Cius leverages the high penetration of Cisco® Unified Communications for business. The company has installed "more than 23 million" of their IP phones at 85% of Fortune 500 companies. The Cius is smaller than the iPad at 7" versus 9.7", allowing docking with a desktop phone stand. One of the interesting features is that the Cius will employ an Intel Atom 1.6-Ghz processor with 32-GB of flash memory. This is the second big announcement of an Intel-based Android device in a little over a month, following on the announcement of Google TV. Also interesting is the list of connectivity modes listed for the Cius: 802.11a/b/g/n Wi-Fi, 3G/4G data and Bluetooth 3. Cisco has been active in WiMAX network development with Clearwire and was recently a sponsor of the 4G WiMAX Symposium at Stanford University. Cisco will help expand Android developed applications for business by offering Cisco Collaboration Application Protocol Interfaces (API's) to developers through a Software Developer's Kit (SDK). 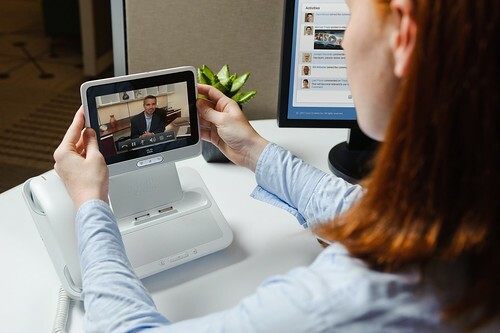 Make a voice or high-definition video call at the desktop or remotely. 5-megapixel rear facing camera that can transmit streaming VGA quality video and capture still images, and dual noise-cancelling microphones for audio conferencing. Join or initiate an audio, web, or Cisco TelePresence solution conference (not sure why WiFi only, with 4G built-in). Create, edit, and share files and videos. Browse the web with an integrated Firefox browser. (And, I would assume, support for Adobe Flash). Support for cloud computing through desktop virtualization. "The tablet will come standard with a virtual desktop client application, so it can act as a thin client on your Cisco Collaboration Architecture". At Cisco Live! the Cius was demonstrated for use in an academic setting, and applications were also discussed for other other markets such as retail and medical. Will we also see a consumer version, migrating the Cius technology to the Cisco Flip brand? "Cisco Cius Mobile Collaboration Business Tablet by Cisco Pics, on Flickr"